MEET ZUMA’S NEW MAKOTI! The bride’s name is Shanice Stork. Home President Jacob Zuma Trending News MEET ZUMA’S NEW MAKOTI! The bride’s name is Shanice Stork. 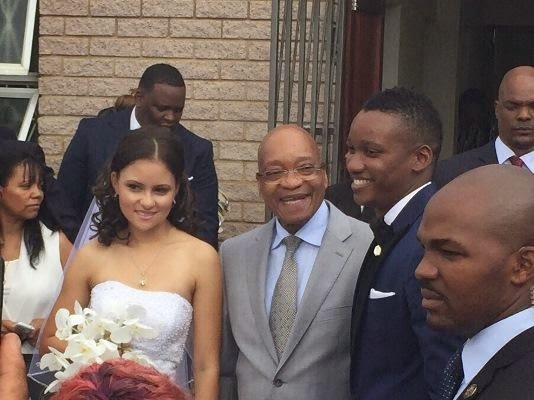 ELIGIBLE bachelor Duduzane Zuma is finally off the marriage market! Jacob Zuma’s new makoti is Shanice Stork of Durban, Times Live reported. The couple tied the knot yesterday at the Fairmont Luxury Resort in Zimbali, where News24 reported that an elegant white marquee had been put up. On Friday at Nkandla a Zuma relative said: “We are very excited to be getting a new bride. “Some of us have left for Durban in two taxis. But we’re at home, brewing beer. “We’re preparing for Sunday’s umabo, when her family will present us with gifts. We will slaughter four cows. Two weeks ago we went to Durban where our families exchanged gifts. Duduzane (32) is the twin brother of Duduzile Zuma. Their mum was Kate Mantsho, who married Jacob Zuma in 1976. The couple had five children, but Kate committed suicide in 2000. Yesterday Duduzane’s long-term girlfriend Tatum Keshwar took to Twitter to put an end to widespread rumours. She denied that she would be Msholozi’s makoti. Other rumours have now been squashed which linked Duduzane to several of his former companions. In December, Randburg Magistrate’s Court found that Duduzane’s negligence led to the death of a minibus passenger when his Porsche crashed into it. But the National Prosecuting Authority declined to prosecute due to lack of evidence.